A quick workday meal for the entire family. 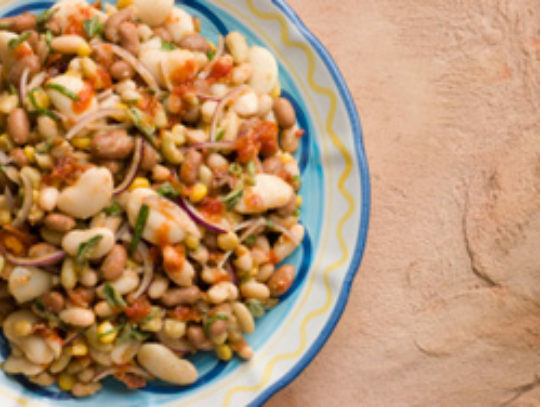 Place beans in a salad bowl. Set aside. Heat ridged grill pan or barbecue grill. Coat grill or pan with cooking spray. Grill salmon: Cook for 10 to 15 minutes, turning once, until cooked through. Use a sharp knife to check for doneness. When done, cool 5 minutes and divide into four sections. Coat non-stick skillet with cooking spray. Sauté onions until translucent. Add garlic and continue to sauté for 1 minute more. Stir into reserved beans. Add cucumber, bell pepper and mint. Toss the salad. In a small bowl, whisk together orange juice, zest, vinegar, oil, salt (if using) and pepper; toss with salad. Place lettuce cups on four plates. Top with salad and place salmon alongside. Serve immediately. DIETITIAN’S NOTE: Packed with fiber, potassium, and your daily allotment of omega-3-rich fats, this Italianate dish is a winner!